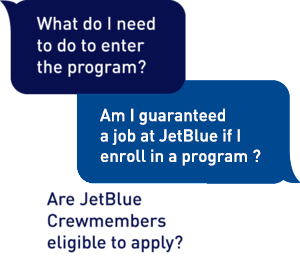 JetBlue pilots are among the most highly qualified in the industry. In addition to exceptional experience and training, our pilots share a passion for safety, customer service and caring for their fellow crewmembers. JetBlue pilots inspire teamwork and take pride in making values-based decisions in the air and on the ground. JetBlue’s five values are the foundation of who we are and fuel our commitment to excel in the industry. The values shape our culture and in using them, we inspire each other and our customers. Safety, Caring, Integrity, Passion and Fun drive what we do and how we do it, every day! Our first officer application window opens for 2–3 weeks each year. To be notified of when the application window opens, complete a profile in our application portal . Once hired, first officers are assigned (and must either relocate or commute) to one of five bases: BOS (Boston), FLL (Fort Lauderdale-Hollywood), JFK (New York), LGB (Long Beach) or MCO (Orlando).